I was born in the beautiful Fraser Valley community of Chilliwack, British Columbia. Raised on a dairy farm, I've had a lifelong fascination with wood, in both its practical and artistic applications and potential. Throughout my artistic career I has sought to utilize wood that would have otherwise gone unnoticed or wasted. Allowing the natural beauty of wood to play the central theme in my artwork is what I strive for. 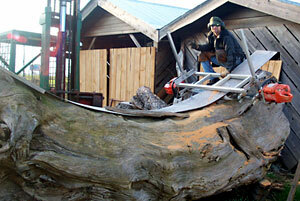 I began working with wood in grade school, later undertaking a full range of training in applied woodworking. This included construction, cabinetry and design. 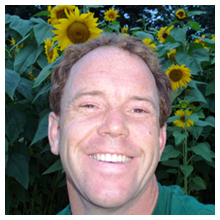 I then worked seven years in commercial construction, acquiring experience with projects ranging from industrial barns to townhouse units. Drawing on this background, in combination with an artistic vision, I began producing one of a kind furniture pieces. I have become known for my naturalistic, graceful furnishings that feature extraordinary craftsmanship and materials. These are produced directly for collectors and corporate clients, as well as on commission from prominent designers and regular folks like Grant. 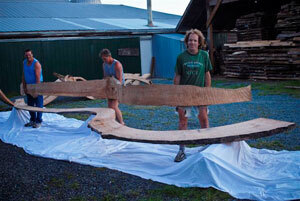 Mount Cheam Woodworking was established in 1983 with the goal of building handmade custom furniture. Kiln dried hardwood was expensive to buy, so in 1986, english brown oak, maple and walnut hardwoods were sawn and air dried for a year per inch thick. 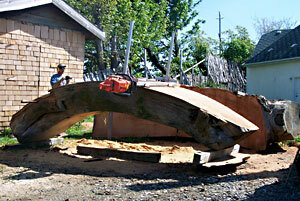 The first logs were sawn by a moble dimension saw that had a 3/8 inch (blade thickness). 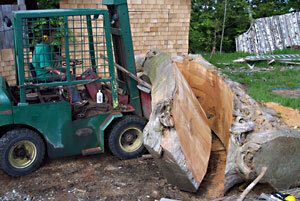 Since then, I have switched to a bandsaw to increase the volume and value of the wood I can get out of a log. 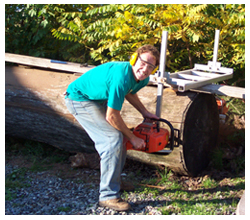 I use occaionally use a chainsaw for oversized or unusual shaped pieces. Our small shop is located in the Fraser Valley and has a high relative humidity which makes it difficult to dry wood properly. 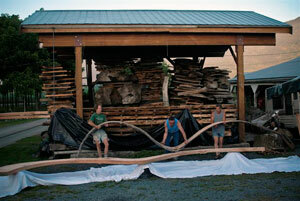 In 1992 a vacuum kiln was purchased and wood is now dried to 6% moisture content. For several years curly, spalted and quilted maple was delivered and sold to some of the best woodworkers on the west coast from Vancouver to Bisbee, Arizona with many stops along the way. While those deliveries were made the desire to create fine home furnishings became stronger. Pieces were entered at the Design in Wood hosted by the San Diego Woodworkers Guild. Now, 20 years later things are changing again, inventory has been taken for the first time and it seems the wood barn contains about 125,000 board feet of dry B.C. hardwood, now attempts will be made to try not to aquire more trees unless they are pistol grip curves or oversize for one piece dining and conference tables. I will still continue to sell wood to others but plan to spend less time sawing logs and more time designing and creating handmade home and office solid hardwood furniture out of some of the most unique precious wood that has been hiding in the back of the wood barn. A lot of people are curious how the unique timbers for our curved benches are cut. A little ingenuity and a lot of sweat goes into the sawing process - the curved planks are cut to match the natural curves of the trees they are cut from - this makes the boards strong and durable and preserves the spirit of the tree resulting in striking and beautiful creations with wonderful grain. See the process on video! A complete reference listing is available on request. 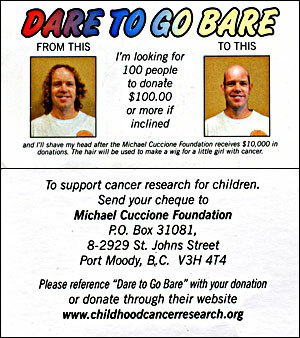 As a way to give back to the community, I've been growing my hair as part of the Michael Cuccione Foundation's Dare to go Bare campaign. When I reach my goal in donations the total amount is donated to children's cancer research and my hair, post-cut, will go to make a wig for a liittle girl. Help out if you can!